Another icon has left the Phillies. The team is in full rebuild mode. 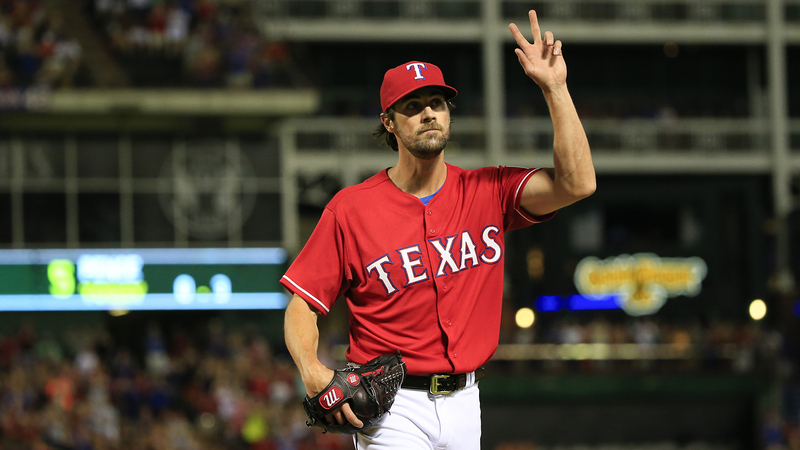 We knew it when they traded away Shane Victorino and then later Jimmy Rollins, but knowing and understanding doesn’t ease the sting at all; Cole Hamels is now a Texas Ranger. Years ago, I began collecting bobble heads given out as promotions at Phillies games. I have amassed quite the assembly, including the likes of Ryan Howard, three different Chase Utley’s, Jimmy Rollins, Brad Lidge, Cole Hamels, Roy Oswalt, Hunter Pence, two Carlos Ruiz’s, Placido Polanco, Cliff Lee and Roy Halladay. It’s hard to believe so many big name players donned Phillies uniforms in the past eight or so years, and yet the franchise has only one World Series Championship to show for it. When I started my not-so-new-anymore job this past September, I decided to bring a few bobble heads to work to personalize my cubicle a bit. I limited the number to three; enough to say “Hey, I like sports!” but at the same time, not so much that I’d be writing that phrase on a baseball bat and bashing my colleagues over the head with it. I decided to take only one Phillie with me. It was easy (logically, not emotionally) to cross all the former players off the list of potential picks. A tempting choice was Chase Utley for many obvious reasons, but after having him with me for all four years of college, I decided it was time for a new face: Cole Hamels. Guess it wasn’t meant to last. Hamels was dealt to the Rangers late Wednesday night, less than two days before the trade deadline. This was a far cry from the end of an era for the team; that moment occurred when Ryan Howard tore his Achilles tendon making the final out of the 2011 NLDS against the Cardinals (unfortunately for the Phillies, it took upper management three more years to acknowledge it was time to start rebuilding). No, this moment was much more about the individual than the state of the team. The last starting pitcher remaining from the 2008 World Series Champion squad has left the city. His legacy in the City of Brotherly Love has undoubtedly left a mark on everyone here. The Phillies drafted Hamels out of Ranchero Bernardo high school in California in 2002, making him their first round selection that year. It was a daring pick–Hamels fractured the humerus bone in his throwing arm the year before he was drafted–,but the club desperately needed to infuse the team with some quality arms, as that year’s rotation featured such stalwarts as Randy Wolf, Brett Myers, Vincente Padilla, Brandon Duckworth and Robert Person (in all fairness, Myers was a 21-year old who developed into a solid number two guy for the team). In addition to the fractured arm, Hamels had multiple bouts with elbow and back issues during his years in the minors, leaving many to declare him injury-prone. Fast forward four short years, however, and Hamels made his major league debut at the tender age of 22. He never looked back. After a solid rookie campaign cemented his place on the big league club, the 23-year old pitched his way onto his first all-star team in his first full season in the Majors. Things were looking up for the team as well. Veteran leader Jimmy Rollins was running on all cylinders (mouth included), while youngsters Ryan Howard and Chase Utley were quickly developing into stars. The Phillies won their first division title since the 1993 team due in large part to Cole’s 15 wins (and let’s not forget the epic Met’s choke job). Although the Phillies got swept in the divisional round of the playoffs by the red-hot Colorado Rockies, there was an abundance of hope surrounding a perennially lousy franchise and its young ace. Any Phillies fan can recite what happened during the magical 2008 season. A perfect storm of acquisitions and improvements led to a World Series Championship. Jamie Moyer got another year older and couldn’t have cared less; the offensive juggernaut continued to roll and grow; a group of journeymen and has-beens turned into one of the best bullpens in the league; Brad Lidge forgot that blowing a save was an option and the team’s big trade deadline acquisition was Joe Blanton(!?). I could go on and on about how this was accomplished in depth, but this article is not about the Phillies; it’s an ode to Cole Hamels and his dynamic career in red pinstripes. Hamels had one of his best seasons in 2008, but it’s what he accomplished in the playoffs that made that season truly special. Cole pitching through the World Series elements. Cole took the bump for Game 1 of the first round, tossing an eight-inning, two hit shutout against the Milwaukee Brewers en-route to the Phillies’ first postseason victory since 1993. The team won the series handily in four games and advanced to take on the Los Angeles Dodgers. Throughout all my years watching baseball games, I can only think of two opposing players who truly made me hold my breath every time they stepped to the plate: Albert Pujols for most of his career, and Manny Ramirez in this series. Again, Hamels was called on to start game 1. In the first inning, Manny crushed one of Cole’s offerings that missed being a home run by mere feet, resulting instead in an RBI double. Hamels settled down after that, going seven strong innings and getting the win. He also started and was victorious in the fifth and series-clinching game, and was awarded NLCS MVP honors. Manny, for the record, hit his second home run of the series in that game, ending his postseason reign of terror with an unheard of .533 average. 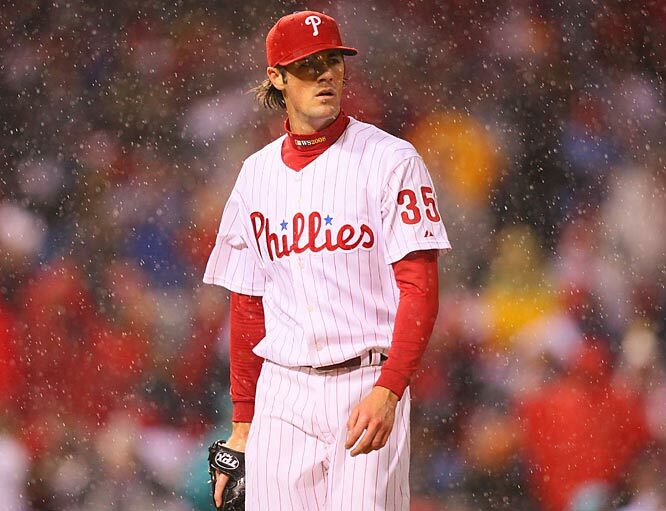 The biggest challenge the Phillies faced in the World Series was not the opposing Tampa Bay Rays, but the weather. Rain delayed the start of Game 3 by over three hours and game 5 was postponed after six and a half innings and finished two nights later. Keeping with the script of the first two series, Hamels took to the mound for Game 1 and came away with a win, again. With the Phillies up in the series three games to one, Hamels looked to finish off the Rays and bring a Championship to the starved city of Philadelphia. While he didn’t get the victory due to the odd circumstances of the game, the team did, two days later and he was named World Series MVP. Bringing a championship to a sports-crazed city that hadn’t won one in a quarter century forever entrenched Hamels in Philadelphia sports lore. 2008 was the high point of Hamels’s career, and this should in no way diminish what he has accomplished since then. Cole not only shed his injury-prone designation, but he became a model of consistency. From 2008-2014, he started at least 30 games in every year (he is on pace to surpass 30 starts again this season). Over that time span, he pitched at least 200 innings in all but one of those seasons (again, he is on pace to throw more than 200 innings this year). Each year, he started the season with the expectation of being a top 10 starter in baseball, and (way) more often than not, he lived up to the promise. He has a sparkling career ERA of 3.31 and a very respectable 1.15 WHIP, while striking out nearly a batter per inning. His 114-90 career record isn’t overly impressive, but we have to remember that the Phillies had an uncanny inability to score runs in games he started. His numbers to this point in his career at the very least warrant serious Hall of Fame discussion. Recent shoe-in inductee Greg Maddux posted career ERA and WHIP numbers only slightly better than Hamels’, while striking out significantly fewer batters per nine innings (8.7 for Hamels and 6.1 for Maddux). And at 31 years young, Hamels certainly has time to improve on his resume. There is some bad that comes along with Cole’s greatness (hey, no one’s perfect). In 2009, Hamels put together by far his worst season (, which would still be considered about average for a major league starter). The most egregious part of the season was during the World Series. The Phillies, this time battling the New York Yankees, were trying to win back to back championships. Hamels did not do his part, putting together a sub-par performance (, an understatement with his 0-1 record and 10.39 ERA). After he lost game three, Cole said that he could not wait for the season to be over. This is hardly what anyone wants one of their star players to be saying while contending for a championship. 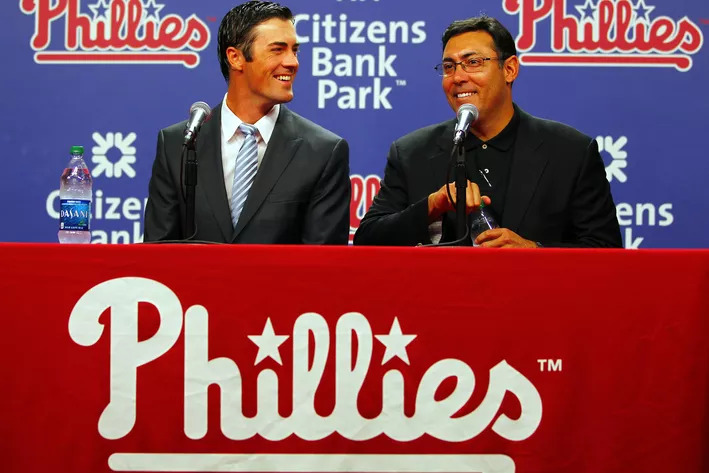 In the past few years, Hamels has said multiple times that he wanted to be traded to a contender, but to his credit, he did so with much more professionalism than Jonathan Papelbon. Like I said, no one’s perfect. This trade has been in the works for years. But Hamels had plenty of redeeming qualities too, on and off the field. He and his wife have been very active philanthropists in the Philadelphia area. A few days after he was traded, he took out a full-page ad in the Philadelphia Inquirer thanking the fans and the city, reaffirming that he is just a genuinely nice guy. In 2012, I took a family trip to San Francisco when, completely by coincidence, the Phillies happened to be in town playing the Giants. One night we went out for dinner, and at a table nearby, I noticed the likes of Hamels, Hunter Pence, Raul Ibanez and Cliff Lee. My dad and I walked over to the table and asked for a picture. We were polite, but the players were understandably not amused. Cliff Lee had a look in his eye like he wanted to jump up and stab us both with a knife, but Cole courteously explained how that wouldn’t be a good idea (players…alcohol on the table…middle of season…bad image…). Cole simply talking to us and letting us down easy was more than any of the other players seemed willing to do, and his handling of that moment displayed his geniality. The month leading up to this trade deadline had a different air to it, despite Hamels being a human rumor mill for the past two plus seasons. It really felt like this was the year he was finally going to be traded. And while I admit it was necessary for the Phillies in their rebuilding process, it didn’t feel good. His third and second to last starts as a Phillie were two of the worst in his entire career, and had some media outlets wondering if he was hurting his trade value. I joked to my mom that he secretly didn’t want to be traded and was trying to pitch his way into staying on the team. Then July 25th came, and Hamels put on a show for what would turn out to be his Philadelphia encore; he no hit the Chicago Cubs in historic Wrigley Field, the first time that the Cubs had been no-hit in fifty years. The last guy to do it? Hall of Famer Sandy Koufax. His performance in that game and it being his last in a Phillies uniform, is nothing short of astounding. It reminded everyone in baseball of just how talented he is and provided the city with a genuine feel good moment in a season full of turmoil and failure. And that was something truly special. So, for now at least, I will not be replacing the Cole bobble-head on my work desk. He worked hard to gain that spot and deserves to be handsomely rewarded for his efforts. His long list of accomplishments and overall likability have cemented him in the hearts of Philadelphia fans forever, no matter what his or the team’s futures hold. His legacy in red pinstripes will live on forever.